Recently, I closed a major chapter in my life. I finally realized that the guy I loved and slightly waited for, for some time now, wasn’t going to be by my side as Mr. Jeigh. I didn’t do the letting go and if he comes back to me, then it is meant to be; routine. I just decided it was time and walked away. I truly believe that all the relationships that followed this relationship were all sabotaged because of my holding on. With each preliminary round of hopefuls, they didn’t compare to CC or to what I believed I wanted in a relationship. I have grasped that I have compared every other guy to him and it was truly unfair to these guys and relationships, yes it was all my fault! For all of you asking, how did I do it? I first accepted that we will never be together again. 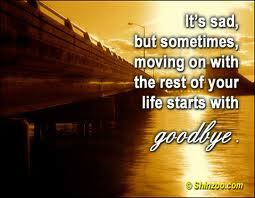 And second, if I truly want to be happy or want another relationship, then I have to walk away and let him go. I understood that I had to begin to put all of my energy into moving on and enter into the next relationship with a clean slate. As well, I can no longer do a comparison of the candidates. So I took it upon myself to break a vicious cycle and close that chapter on CC. There will always be love for him in my heart but I can no longer let what we had be a qualification for my next relationship. I noticed during the break off from relationships, that the wait game I had for CC was the determining factor for the demise of all my subsequent relationships. Since, I have closed that chapter on CC, I have opened up a possibility for a solid relationship. I am no longer feeling guilty for wanting to date someone else. If we should ever run into each other, I would have the confidence to introduce him to my new beau as my “man” not as a “friend”! I am happier and open to love again! CC should have been called BCC. Because now, you are open and willing and have no problem with an introduction of a NEW man. So, now...it's not in the blind (BCC), a new beau can be included (CC).